I don’t know about you, but I love special little cards that have some kind of interactivity to them – especially for Valentines. And tiny valentines? They remind me of childhood and those sets I got to pick out…Betty Boop themed, or Disney, or whatever my passion of the day was. I decided to get out my Envie die set again and make one for my niece, and also a bunch for a church fundraiser I’m working on for Valentines Day. 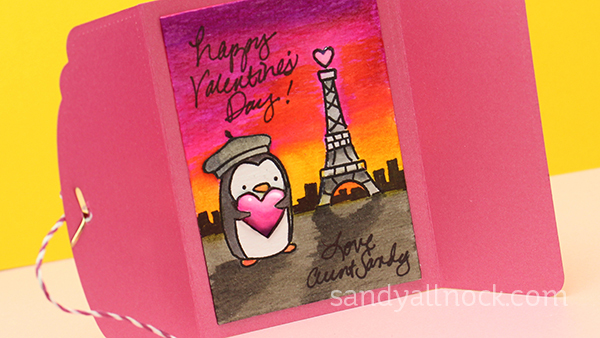 And I just got the little penguin and Eiffel Tower from Poppy Stamps too, and since I’m reminiscing about being in Paris almost a year ago – that was the perfect set to use. Watch the video below, or click HERE to watch on YT. Aren’t these darling when all wrapped up with a bit of twine? Actually it’s hemp cord – which stays in place better than twine – it’s just slightly stiff, so you can bend it nicely into a bow. 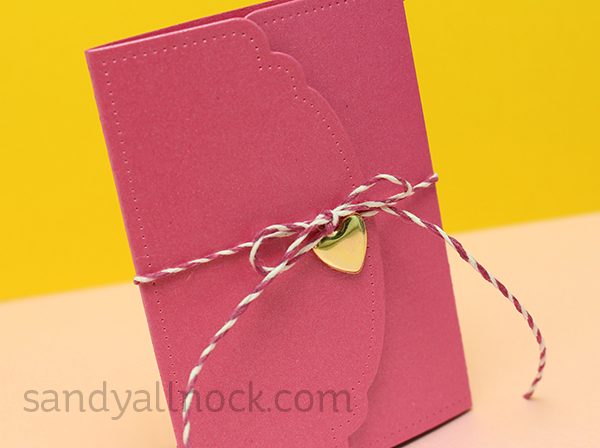 Such a cute way to tie a card! That is just the cutest! The sky really took my breath away. I use those Petallics papers all the time. I get them online and they really have some awesome colors. I enjoy all your work and your videos! I don’t usually reply to blog posts, but I wanted to let you know how adorable this valentine is!!! I’m always on the lookout for fun cards to give my 20 yr old nephew. He loves fun movable cards. This is perfect!! Thank you for sharing this!!! Sandy, what a terrific card! I did find the heart shaped closer by searching “paper fastener” instead of brad. There are quite a few out there, as well as some highly colored ones. Sandy, I LOVE, LOVE, LOVE this! It is so adorable and cute! And I love your Zig marker background, which looks amazing! Thank you for the inspiration! 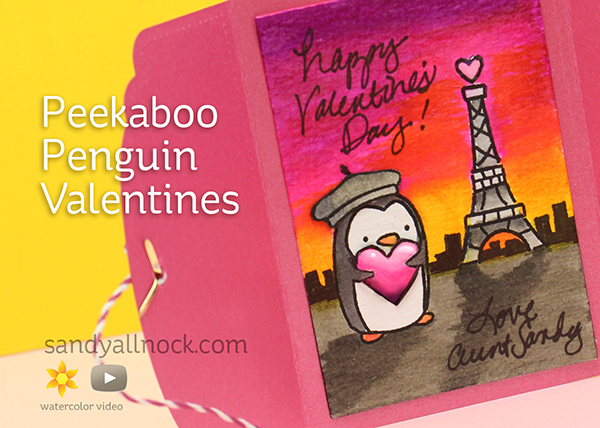 Love that peek-a-boo valentine idea! The image and the coloring are gorgeous. Love that paper! Very cute card. What a cute idea. Love your penguin and coloring. This is adorable, Sandy! I don’t have that exact envelope die but I have a similar one and I’m going to have to try this! That is adorable Sandy! What a beautiful scene you created using those Color Brush Pens! Had to pin it to try. TFS! Your niece will love it and probably treasure forever. What a sweet and endearing image! Thanks Sandy for sharing this with us.